It’s hard to believe that it’s been nearly a year since I was in Portland (in Oregon…it’s been even longer since I’ve been to Maine). Last weekend was the International Food Blogger’s Conference, held in Portland this time, and I am disappointed I wasn’t able to go. 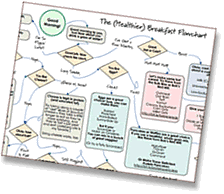 I had a good reason — it was the weekend after our wedding (! ), and we’re both still catching up — but it doesn’t change that I sure feel like I missed out. Not just on the conference (which has a special spot in my heart, since IFBC was my first food blogging conference), but because I miss Portland and I really, really want to go back. 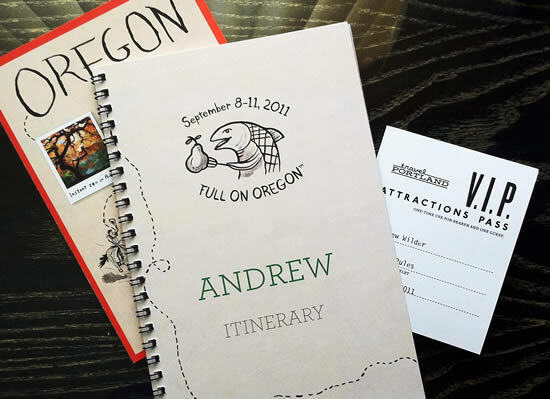 My visit last year was part of the “Full On Oregon” tour, a press trip with all elements hosted and arranged by Travel Oregon and Maxwell PR. The trip was phenomenally designed and executed, down to every last detail. Although I posted about my behind-the-scenes tour of Bob’s Red Mill, I was remiss in not writing more about the trip. It was such a full weekend that writing about it has been a bit intimidating, to be honest, and now, as I fondly go back through my photos, I’m still having a tough time summing up the experience. 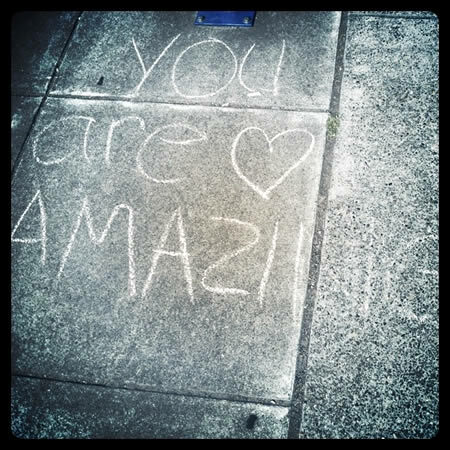 But in the wake of IFBC — and with Feast Portland, the Food & Wine Festival, coming up next month — it is high time I share at least a glimpse of my #amazing weekend in Portland. I call Bob’s Red Mill (and Cassidy, their social media manager) my “Patron Saint of Blogging” since they’ve been so supportive of Eating Rules since the beginning. So when I had the chance to get in a few hours early to see Cassidy and visit the Bob’s Factory, of course I jumped. Here’s the full tour. On the first evening we split up to hit a few different restaurants. 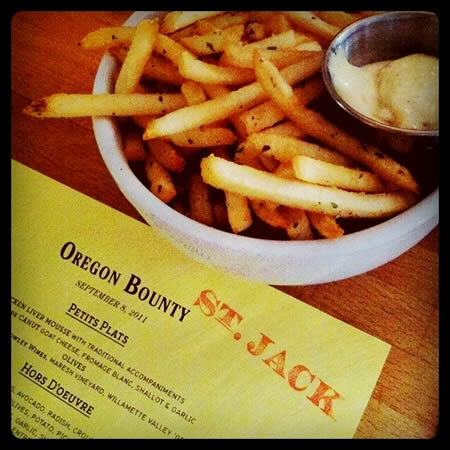 My group headed to St. Jack, part of Portland’s “French Revival” scene, where the food and company were both splendid. What stood out most for me that evening, though, was how they delivered the wine. They brought it to our table in carafes, filled from the casks they get directly from the winery. They have a direct relationship with their favorite winery, and buy the wine in small kegs. No bottle waste! 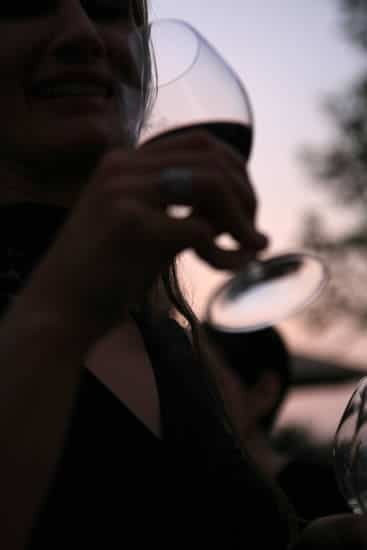 Besides the obvious environmental benefit, it saves a considerable amount of money, so they’re able to keep the prices down — and provide wines from smaller wineries who can’t afford the expense of large bottling equipment. Apparently this practice is fairly common in Portland, and I hope more restaurants in other towns will start doing this soon, too. This is where our trip went up to eleven. After breakfast the next day, a few of us more adventurous types left from the Hotel de Luxe. 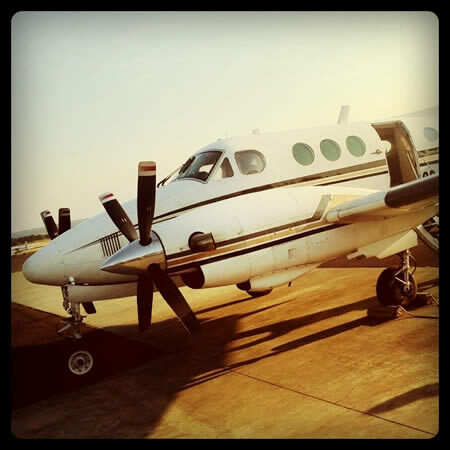 Not knowing where exactly we were headed — but trusting fully in our leaders — we arrived at a small, regional airport. Our chariot awaited. We then went for a tour of Wildlife Images, an animal rehabilitation and education center. They’re doing some terrific work, and I’m grateful we had a chance to stop by and check it out. 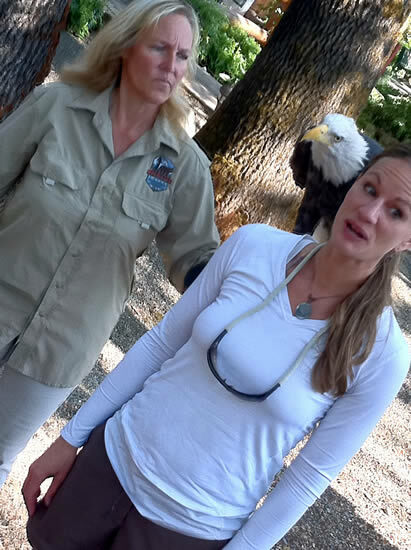 Janelle from Talk of Tomatoes, with a very, very large bird of prey over her shoulder. Next up was the Rogue River itself. The water levels weren’t too high, so we were able to relax and enjoy a few rapids, but above all, soak in the gorgeous scenery and wildlife. Also, we learned that good beer in cans (compliments of Caldera Brewing in Ashland, Oregon) is a really great choice on the river. 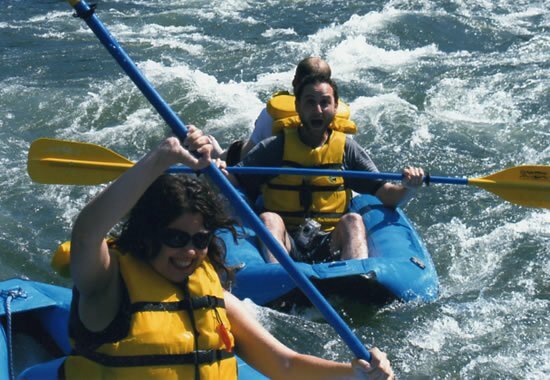 Nicole from Pinch My Salt in the foreground, along with yours truly…and our pilot riding “jump seat” in the back of my kayak. After lunch on the beach, Chris, our pilot, decided to leave his paperwork in the hangar and come along with us. He rolled up his pants, and joined us for the rest of the way down the river. He rode on the back of my kayak down the rapids. Awesome. The next morning, we split up again and my group headed over to Steven Smith Teamaker. They create small, handcrafted batches of flavorful, who-needs-coffee-anyway teas. My favorite was No. 86, the Long Jing Dragonwell. 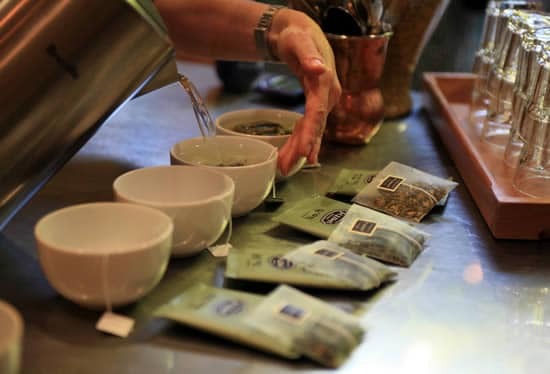 If you make it to Portland (and if you like tea), a visit to their tasting room should definitely be on your list. 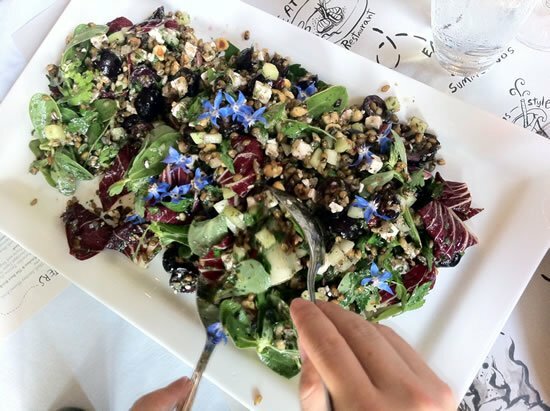 Frikeh, Feta, Cucumber, and Cherry Salad from Scott Dolich. Scroll down for the recipe! Everyone reconvened at Kitchen Cru, a shared use community kitchen and culinary incubator (what a great idea!) and enjoyed a family style lunch. 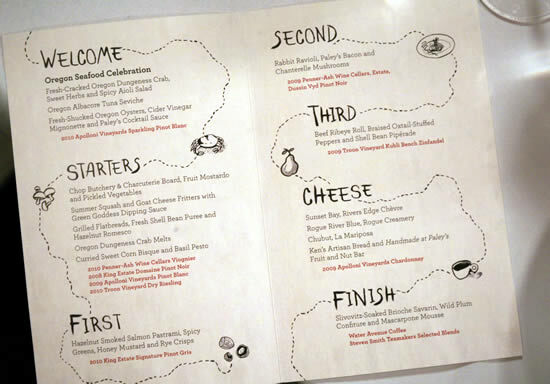 Three of Portland’s preeminent chefs came together for a sumptuous meal. Chris Israel (Grüner and Kask), Jenn Louis (Lincoln Restaurant and Sunshine Tavern), and Scott Dolich (Park Kitchen and The Bent Brick) just kept the spectacular dishes coming. I was particularly blown away by the Frikeh, Feta, Cucumber, and Cherry Salad — which was such a delightful blend of flavors that I couldn’t get enough. Chef Dolich was kind enough to share the recipe, and give permission to share it with you — scroll down to the bottom of this post to find it. Practicing cocktail shaking skills with Linda, Georgia, and Gaby. Somehow — and I’m not complaining, mind you — I was grouped with the drinking crowd on several occasions. This time, we made our way to the uber-hip Rum Club, where we had the place to ourselves for an afternoon mixology workshop. 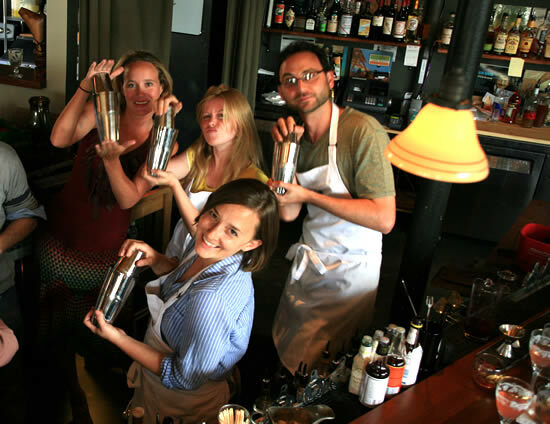 Brandon Wise, bartender at Beaker and Flask; Jade Brown Godfrey, Bartender at Greg’s Grill; and Ryan Csanky, Executive Director of the Oregon Distillers Guild showed us a few tricks of the trade. Ryan also shared a taste of his homemade Grappa, distilled from, if I remember correctly, his homemade Pinot Noir. I am so not kidding. The Will-am-ette (the emphasis is firmly on the “am”) Valley is breathtaking. 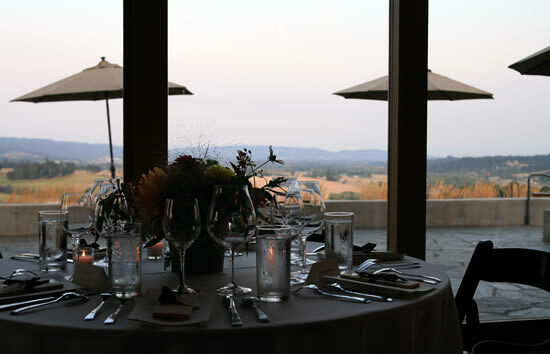 And Penner-Ash Wine Cellars, hosts of our final dinner, boasts infinite vistas and terrific wines. Being a native Californian, I’ve tended to look locally for my wines, but the Oregon wines certainly hold their own — and then some! We finished our tour with the “Grand Feast,” from Chef Vitaly Paley and his team from Paley’s Place. It lived up to the name (and extra thanks to the team for accommodating my pescetarian proclivities! As delicious as the Rabbit Ravioli looked, I loved my Mushroom Risotto and Salmon). This wasn’t an official destination on our trip, but I was told — wisely — that no visit to Portland was complete without a visit to Powell’s Books. In this Amazonian age, walking through a real-life bookstore feels like a rare treat. There’s an incomparable magic in doing so that cannot be found online, for sure. I’m not ashamed to admit that, while walking around Powell’s, I was actually so joyous that I started to tear up a bit. 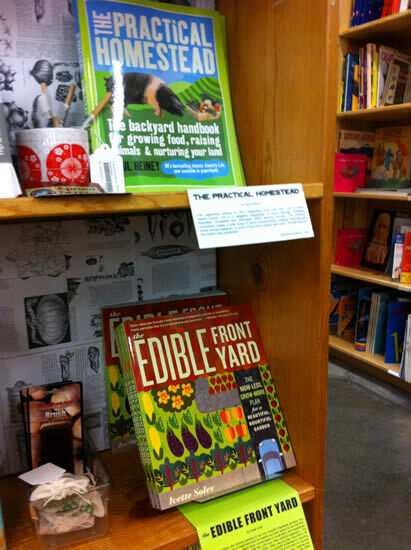 So if you’re in Portland, go to Powell’s, okay? As wonderful as the food, drink, and experiences were, what made this trip so memorable was, quite simply, the people. Not just my fellow food bloggers (a “very well curated” list of folks), but also the chefs, bartenders, adventurers, guides, and so very many Portlanders (Portlandians? Portlandites?) who welcomed us with open arms, excited to share with us the bounty of Oregon. I’m especially grateful to the Travel Oregon and Maxwell PR crew for putting this trip together and inviting me to take part. To Vicky, Stacy, Linea, Kevin, Emily, and the rest of the team: Thank you. It’s because of you that I’m Full on Oregon. 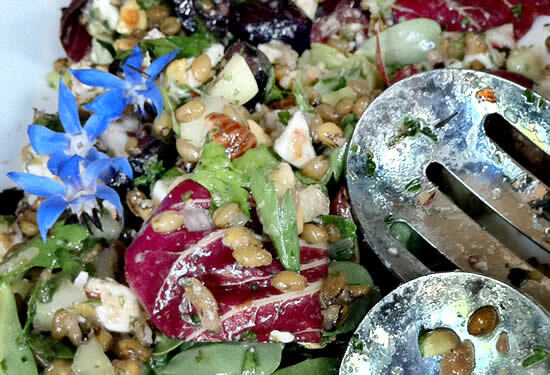 This salad is a delightful and surprising combination of flavors, and is vibrant enough to be the centerpiece of the meal. Frikeh (or Freekeh) is a grain from green wheat, which goes through a roasting process to impart a unique, toasty flavor. 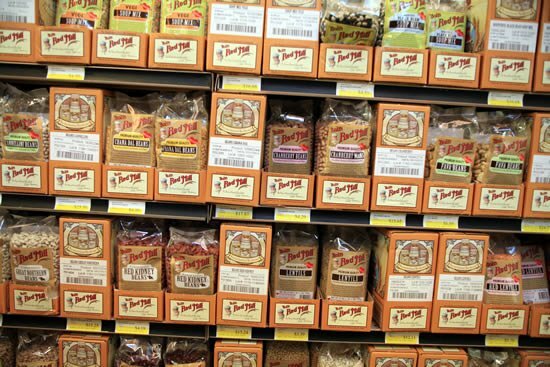 It can be hard to find, so substitute Farro or Barley if need be. This recipe is from Scott Dolich, the chef/owner of Park Kitchen and The Bent Brick in Portland, and is shared with his permission. Caramelize the onion in olive oil. Add frikeh and vegetable stock, and simmer for 25 minutes or until tender. Cool completely. Combine all ingredients for the salsa and stir together. Toss all ingredients in a large bowl, and coat thoroughly with salsa verde and lemon. Plate and serve. I adore Portland! Sounds like an amazing trip. I might also be working with one of the places you mentioned, so this was great timing on the write-up! Nice post, it makes me teary-eyed about my own home. I live in the Willamette Valley, I make wine here. I love it. And your post just reminded me why! What a great trip! I’m about to move away from this wonderful city and will be missing many of the above. Living in a place where real food is easily accessible has been a luxury. Thanks for sharing your trip and great nutrition knowledge with us.